Boilers are an important part of a home and commercial business heating system, considered to be not only highly efficient but very cost effective. They can be powered by natural gas, oil, propane as well as electricity. A boiler is an appliance used to heat water for residential & commercial heating systems. These systems utilize the hot water from the boiler to spread the heat throughout the home or business by utilizing pipes to distribute it into different rooms and dispersing the heat through various types of radiators. Once the radiator is heated with the hot water, the water is then returned to the boiler to be re-heated and then the circulation flow can continue. Although most modern homes do not have a boiler, most people with a boiler can use that same unit for years provided it is repaired and maintained properly and consistently. Call Perry Aire Plumbing at 703-521-2228 for boiler installation and repair services in Arlington Virginia, Washington DC and Maryland! Hot Water Boiler: These are smaller, low maintenance units that heat water to a temperature of 160-180 degrees Fahrenheit. 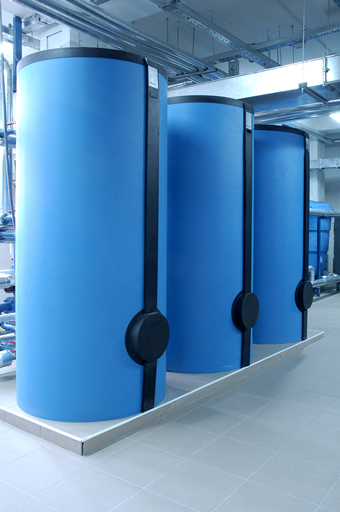 The heated water is circulated through the building’s pipes, which heat up the radiators within each of the rooms. The water eventually cools and is directed back to the boiler through a return pipe and the process restarts again. Steam Boiler: Not quite as commonly used today, as they are much more complex than hot water boilers. Found mostly in older homes that haven’t converted or upgraded yet, they operate with pressure gauges, blow-off valves, automatic feeds and special gauge glass. Steam heat is created from water that is generated in a gas, oil or electric boiler. It then goes through the pipes and radiators or convectors, where the steam turns into water and cycles back to the boiler. Why should you call Perry Aire Plumbing for boiler replacement and repair services? We have over 35 years of plumbing experience and our professionally certified plumbers are committed to providing exceptional plumbing services and repair for residential homes as well as industrial and commercial businesses. We offer excellent service at competitive prices! We have 2 local offices in the Arlington and Fredericksburg, Virginia area, and our plumbers are dispatched throughout the Northern Virginia, Washington DC, and Maryland areas. No project is too big or too small! We have all your plumbing services and repairs covered. From plumbing upgrades, installations, to maintenance, troubleshooting and repair! Whether you are a home owner, commercial or industrial business, our licensed plumbers have all the necessary experience to aid you in all your plumbing projects. We provide high quality service without the high price. Contact us today for a quick quote! Plumbing experience and knowledge for all services and repairs. The complete and necessary training for any plumbing problem or issue. Using the latest plumbing equipment and quality cost effective products. Skills for all residential, commercial, and industrial plumbing repair services. Copyright 2013 Perryaire • Providing Plumbing Repair Services in Arlington VA, Washington DC, Maryland, & Virginia. Call us today 703-521-2226!